Kids TV apps, websites and games no longer come last, says Plug-in Media's MD. Could they eventually replace pilots? At some point there has usually been an assumption that the assets created for TV can be repurposed for interactive so there then follows a frenzied attempt to shoehorn hefty broadcast quality animation, or whatever live action clips are left on the cutting room floor, into a cohesive interactive experience. Of course, there are some brilliant examples of content that have been created in this context delivering a well-designed, unified experience that can demonstrate enviable engagement from its audience. When the content you’re creating is divorced from the original TV production cycle, achieving a synergetic experience that does the brand justice can be tough. We always refer to a re-skin of the traditional pairs game as the typical, careless interactive extension that is not riven through with the brand’s DNA at all, but a cheap nod to “doing something online”. When so much of the digital content is given away for free, there continues to be little incentive to create something beyond that pairs game – the case for ROI when it comes to interactive is very shaky indeed – no wonder its position is hard to justify when other marketing and licensing extensions generate actual revenue. At Plug-in Media we’ve always viewed the company’s output as entertainment in its own right and more than just a marketing add-on. This position is driven by our audience specialism – creating entertainment for kids means delivering content (both interactive and linear) to them across the many screens they have access to. Whilst TV may continue to be in pole position, that’s an extremely tightly-fought placing. We know that mobile tablets and phones, as well as desktop computers, garner at least as much of their attention, and much of that simultaneously with the TV set. It seems to me that there is something of a sea change in the air and the status of interactive content is finally changing. Could it be that now is the time when digital is no longer the bridesmaid but finally gets to be the bride? There are plenty of stories out there to back this trend up: Whale Trail was optioned for TV development by Penguin; Disney debuted Where’s My Water as an app before creating a web series around Swampy the Alligator; Rovio has been making episodes of Angry Birds Toons; and we’re all eagerly awaiting the output of Mind Candy’s Moshi Monsters TV series. Will these examples, and others, drive us to a position where it’s now TV that becomes the afterthought? And if that happens will we end up serving our audience the TV equivalent of a re-skin of a pairs game?! At Plug-in Media we have spent the past 18 months plotting our move into original IP development. The market conditions would certainly appear to be auspicious for this move. Whilst our strategy involves creating and publishing game only IPs, for other projects on our slate (such as Tee and Mo), TV is still very much part of our overall vision for the brand. So we have been asking ourselves whether digital, games-based IPs can ever deliver enough story to sustain the characters and their world for the duration of a typical 52 x 11’ animated TV series. Just like trying to bend your TV assets into a game, will creating a TV series from a game involve retro-fitting a whole lot of story? To avoid these pitfalls our transmedia development process has been to try to bake-in enough narrative authenticity at the start to sustain brand extension to any number of platforms. 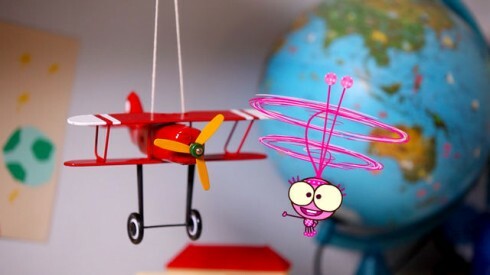 This particularly impacted the characters – whilst the website was 2D Flash animation, Nicole had envisioned early on a mixed media approach for the TV component, where the 2D animated characters would go out ‘into the real world’ and interact with real children. So when the characters and animation style were being designed for the website, she also had to consider how they might look and move in a live action environment. 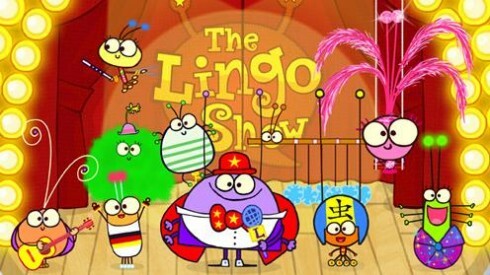 This sensibility was clearly vital to the success of the brand, but there are more general lessons from the Lingo Show’s development that are of benefit for anyone seeking to develop a new kids property in this way. Firstly everyone’s favourites: time and money. Investing what is effectively development budget into an app or on-line experience can seem good value compared to creating a fully animated TV pilot. The Lingo Show website took 7 months to create and our Tee and Mo games have run to a similar timeframe but smaller digital experiences can be created much more quickly. However, even 7 months digital development involves a smaller team and will therefore cost you a lot less than creating an 11-minute animated pilot over a similar timeframe. The real benefits come to play when you consider this timeframe gets you directly in front of your audience – and even sooner, if you test as you develop. For me, I think this provides one of the most powerful and exciting benefits of developing digital first, offering far more flexibility than traditional TV development. Iterative development is now pretty much the established approach to building software but its benefits reach beyond the geek community. For the Lingo Show, completed modules (such as character design or specific interactions) meant that Nicole was able to test her brand with children very early on and evolve it hand-in-hand with their feedback. Of course that feedback doesn’t end when the product is released. As a brand owner with an app, you will likely pour over your customer comments in the App Store and analyse sales data or any other customer behaviours you are tracking via a number of different analytics packages. With an online release, your stats data and social media buzz will provide you (and your commissioning exec) with useful feedback as to how well your brand is going down in real time. The trick to use this qualitative and quantitative data in your product’s next iteration (and that next iteration might well be a TV show), it will help to inform your product in line with audience demand, and deliver strategic pointers as to your where to best place your marketing effort. Of course it helps massively if your interactive content is being delivered to a commission in the first place but even without that backing, coming to a broadcaster or funding partner with a proposition that has already been tested and developed to the point of a digital product (and has hopefully seen some initial success), has got to be a compelling story. I can’t think of a more effective way to pilot! This is the latest in a series of posts exploring the present and future of Kids TV, in the run-up to MIPJunior & MIPCOM 2013. Juliet Tzabar will be at MIPJunior and MIPCOM. Follow her on Twitter here.